What is the minimum amount of information required by a team of networked agents to solve a geometric task? 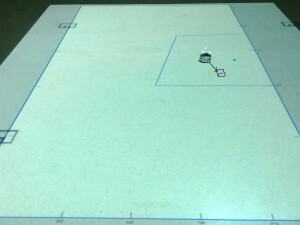 This notion of minimality is explored through the use of set-valued sensors, and the question then becomes what assumptions need to be made on these sensor models. In fact, the set-valued sensor provides a general model of a noisy sensor since different kinds of uncertainties can be explored by imposing constraints on the kinds of sets that are returned by the sensor. 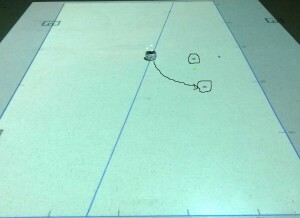 As a first stab at this, the two-agent rendezvous problem is considered where one agent (the target) is equipped with no sensors and is stationary, while the other is equipped with a set-valued sensor. The blue region represents sensing agent’s(denoted S) set-valued approximation of the location of the target T.
The measurements returned by the set-valued sensor are measurable sets which are sampled from a probability distribution and contain the location of the target agent. The set-valued measurements can be viewed as very coarse approximation of the location of the target agent. This approximation can be further improved by making multiple set-valued measurements and taking intersections (represented by the blue area in the figure). The amount of uncertainty in the agent’s measurements is then given by the volume of the measured set. We devise motion strategies which allow us to reduce the uncertainty as we make infinitely many measurements to 0 (i.e the volume contained in the intersection of the measurements). 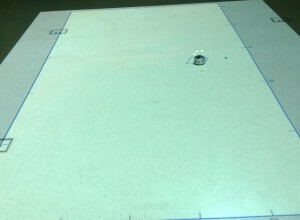 The motion strategy was implemented on a Khepera III robot in a lab environment. T.Ramachandran, M.Egerstedt, “Pair-wise Agreement Using Set-Valued Sensors”, in IFAC Workshop on Estimation and Control of Networked Systems, Sept 2013.